Halfway through “The One Inspired by Roy Cohn,” Cush Jumbo as Luca Quinn delivers a lengthy, gripping, emotionally potent monologue to her small infant son, splayed next to her, unable of course to understand a word she’s saying. She talks through her options, through unnerved confusion about how drawn to motherhood she has become, how much of a priority this small, gurgling thing next to her has become, so much so that it has begun to cloud her desires. She was on the partner track. She knew what she wanted, and she was well on her way. Now, things are a bit more complicated. It’s a perfect example of just how good The Good Fight is at unspooling its characters’ conflicts. Between last week’s Diane bed rant and this Lucca scene, it looks like dramatic soliloquies are going to be one of season three’s recurring story tools. Here, The Good Fight touches on well trodden ideas about women, work, motherhood, the lines between professional and personal lives, but it does it in a way that is compelling, a little bit strange. The device itself is bold and theatrical, but the writing is nuanced, grounded, intimate. It helps that it’s all in the hands of Jumbo, who is such a force. This is far from the central storyline of the episode, and yet the scene stands out as a centerpiece. The Good Fight so often does a lot with a little. But on that note, is Maia just...on a different show entirely? Her plotline here isn’t technically bad, and it’s certainly meatier than last week’s, but it’s still wildly disjointed from the rest of the narrative. It seems possible that The Good Fight is plagued by the same scheduling problems that often became apparent in The Good Wife’s storytelling. Maia is a tricky character. 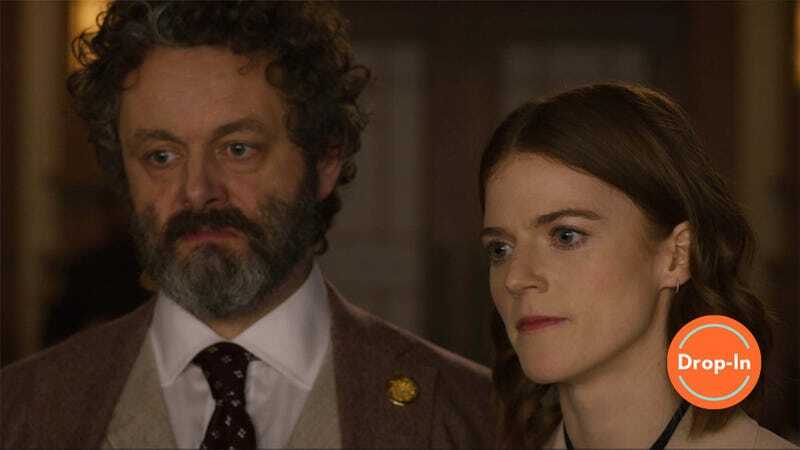 Rose Leslie is hugely talented, and the show has done some really fun, smart stuff with Maia, particular last season when it came to her memory, to the ways she may have known about her parents’ crimes without actually knowing. But with the Rindell scandal out of the focus, it’s difficult to see exactly where she fits in with the show’s narrative, and that becomes doubly true if she’s not going to be in very many scenes with Lucca, which seems to be the case based on these first couple episodes. Much of “The One Inspired by Roy Cohn” relies on its new recurring cast member Michael Sheen, playing a nefarious and unpredictable attorney named Roland Blum, who is indeed inspired by Roy Cohn. He’s brash, and he’s corrupt, lying his way through the case that he and Maia are working on with co-defendants. It’s easy to imagine a mediocre USA series built entirely around this character, and if that sounds shady, it’s meant to be. This character doesn’t work for The Good Fight, which does often bring eccentric bit characters into its world (see: the incredible Elsbeth Tascioni). But in this case, Blum is all bit, no bite. Blum is supposed to be incredibly over-the-top, and that he is. But he isn’t much more than that, and his function within Maia’s arc doesn’t quite click either. He’s making her more...spontaneous? Unscrupulous? This season seems largely concerned with Maia finding her voice, but it’s going about that journey in a way that just isn’t up to snuff with the rest of the series, painting Maia in broad strokes and feeling largely disconnected from the rest of the narrative. There are opportunities for the show to tap into some of its larger themes through Blum, who represents a starkly immoral player in a cast of mostly morally ambiguous characters. But it doesn’t quite get there with this episode. The Good Fight continues to be the most clued-in, visceral series on television in regards to the paranoia, anxiety, and rage many people feel about Trump. Diane decides to process her heightened emotions about her husband palling around with the Trump sons by way of physical violence. She does Aikido and throws axes, overwhelmed by the extent to which Trump seems to be touching all aspects of her life—both personally and professionally. The marital conflict between Kurt and Diane this season is already shaping up to be very interesting. Their relationship contains and plays with a lot of the show’s central themes, especially when it comes to moral decision-making. Diane is willing to play dirty in her renewed vigor to bring down Trump, which has a deeply personal bent to it now. She betrays Tara Strokes, ruining a woman’s life for her cause. The Good Fight treats this with the complexity and nuance it should. Diane Lockhart is no hero. But this fight has always been too complicated for just heroes and villains, although it does have one very clear villain in Trump. Triumphantly making Trump the Big Bad of your show is a bold move, and The Good Fight is absolutely ruthless in the most delicious way about the current administration but without feeling too self-congratulatory about it. Richard Kind gives a delightful guest performance as always. I do hope Maia gets some snappier storylines soon, because Rose Leslie really is so good and because I am contractually obligated to root for lesbian characters. Liz brilliantly plays Adrian in her quest to get more women in top positions at the firm. Their dynamic this season is very interesting. Diane looks so good at the axe throwing bar!!! I am always in awe of the wardrobe on this show.